Posted by Dave Emory ⋅ August 30, 2017Post a comment Email This Post Print This Post Tweet This! Numerous programs and articles on this website have dealt with Nazi involvement with the assassination of JFK, from paramilitary American Nazi elements to individuals and institutions overlapping the Reinhard Gehlen spy milieu. In FTR #188, we detailed the “Hate Bus,” a gambit by American Nazi Party leader George Lincoln Rockwell to protest the Freedom Riders and the Civil Rights movement. It bears some structural similarity to the Charlottesville incident, with fascists staging a counter-event to a progressive demonstration, in this case the “freedom riders” bus ridden by white college students and black civil rights activists in support of integration and voting rights in the South. Gerhard Frey was the editor of the Deutsche National Zeitung und Soldaten Zeitung, which had veterans of the SS and Goebbels’ propaganda bureau on its editorial staff. The publication received financial support from the CIA. General Walker and the Murder of President Kennedy by Jeffrey H. Caufield, M.D. ; Moreland Press [HC]; Copyright 2015 Jeffrey H. Caufield; ISBN-13: 978-0-9915637-0-8; p. 70. 3. In FTR #188, we detailed the “Hate Bus,” a gambit by American Nazi Party leader George Lincoln Rockwell to protest the Freedom Riders and the Civil Rights movement. It bears some structural similarity to the Charlottesville incident, with fascists staging a counter-event to a progressive demonstration, in this case the “freedom riders” bus ridden by white college students and black civil rights activists in support of integration and voting rights in the South. General Walker and the Murder of President Kennedy by Jeffrey H. Caufield, M.D. ; Moreland Press [HC]; Copyright 2015 Jeffrey H. Caufield; ISBN-13: 978-0-9915637-0-8; pp. 73-82. 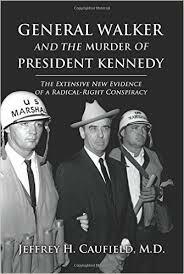 General Walker and the Murder of President Kennedy by Jeffrey H. Caufield, M.D. ; Moreland Press [HC]; Copyright 2015 Jeffrey H. Caufield; ISBN-13: 978-0-9915637-0-8; p. 78. Under Cover–My Four Years in the Nazi Underworld in America by John Roy Carlson; E.P. Dutton & Co. [HC]; Copyright 1943 by E.P.Dutton & Co.; pp. 446-7. General Walker and the Murder of President Kennedy by Jeffrey H. Caufield, M.D. ; Moreland Press [HC]; Copyright 2015 Jeffrey H. Caufield; ISBN-13: 978-0-9915637-0-8; pp. 403-404. General Walker and the Murder of President Kennedy by Jeffrey H. Caufield, M.D. ; Moreland Press [HC]; Copyright 2015 Jeffrey H. Caufield; ISBN-13: 978-0-9915637-0-8; p. 189.